Sunde White Industries|Beavers to the Rescue! I woke up to an orange sky and a heavy brown haze hanging over the city. Smoke from a fire a few hundred miles away was pressing down on San Francisco. For the second year in a row I dawned my dust mask every time I left the house and a coating of ash settled over everything. During the same week the biggest wildfires ever seen began raging down in Malibu. The feeling of sad helplessness mixed with the oppressive air made me feel stir crazy but there was no escaping it until the fires were put out. 48 people had been declared dead and hundreds more were missing. Months later, with the fires put out, I don’t feel totally hopeless. I believe in nature fixing itself if we give her a chance. There is one very adorable solution that I hope more Californians begin to consider seriously. It’s the beaver. 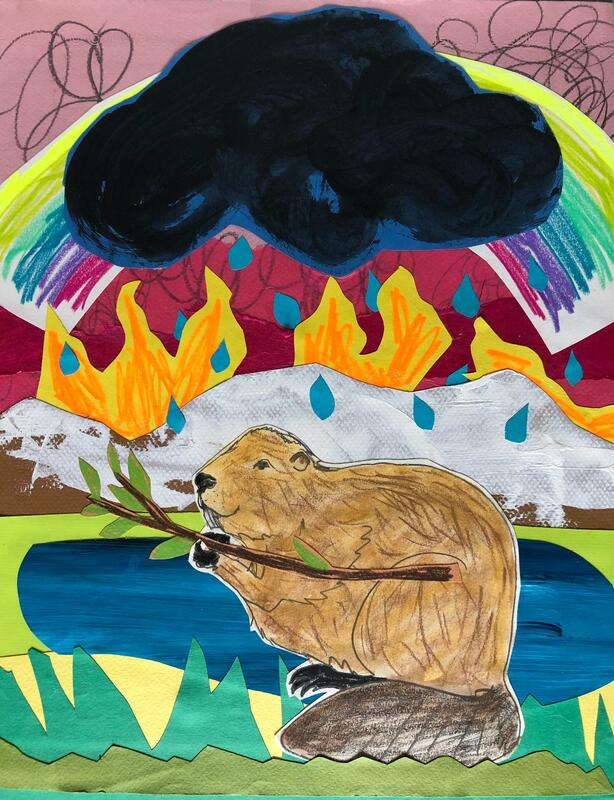 Beavers are a keystone species which means they are responsible for creating new ecosystems that support tons of different species but more importantly, as the snow pack in the Sierras becomes less reliable for our water source, the beaver can help us with our water storage solutions. There’s actually a large number of ways that the beaver is great for the environment like reducing nitrogen in water sources which stops deadly algae blooms, creating space for new flora and fauna to grow and, most adorably, housing animals that need shelter during the winter. But for now here’s a couple of ways they can help with our fire problem. They create water sheds as valuable as the Sierras! It turns out that when beavers hear even the slightest gurgle of water they obsessively start creating a dam, they can’t help themselves. They can turn a dry creek bed with just a little trickle of water into a flourishing pond that ends up creating water flow as it grows. As beavers build their dams, water slowly backs up and begins to pool. But their pool of water doesn’t just widen, it deepens. The beaver digs deeper and deeper into their pool which turns into a pond and then a lake. Their lakes become extra deep because of the beaver’s constant work at deepening them which means the water stays colder than regular ponds, allowing cold water fish and animal species to thrive. Also it doesn’t dry up during the doughts. Picture a bunch of beavers being reintroduced all throughout California, imagine all the new water sheds that would be created! The other thing they do is help with forest management! When a beaver family leaves an area and their ponds dry up, what’s left behind is a large, nutrient rich meadow. That meadow becomes a natural fire break throughout forests. But also, while they are living on their pond, they are constantly clearing out old dead trees which is kindling for forest fires. They create wetlands! Yep, it’s true. Beavers are very family oriented and when their kids go off and create their own families they don’t go that far away from mom and dad. This means that when beavers arrive you will soon have an entirely new system of wetlands that stores water but also stops fire in its tracks! Wow! Beavers really are busy and now we know that they can also be one of California’s great saviors. To learn more about how rad and cute beavers are watch this PBS documentary, “Leave it to Beavers”. You’ll die over them and also become a passionate supporter like me!